My buddy Jeff and I recently spent a week volunteering with an organization called Los Tecnicos that is building a number of small, sustainable, off-the-grid houses about an hour outside of Bogota in a town called Choachi. 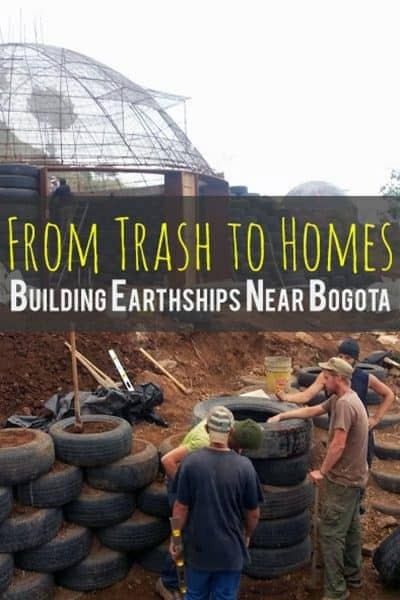 These homes are constructed with predominately with salvaged and reused materials: tires with dirt pounded inside for the walls, plastic bottles packed with plastic wrappers and other assorted garbage to make bricks, as well as other salvaged goods. I had never really seen or heard too much about this approach to construction, besides the little bit I heard about from Jeff: years ago he had volunteered with a partner organization called Long Way Home in Guatemala that does a similar sort of thing. So I wasn’t sure exactly what to expect. The work was certainly tough, but it was an incredibly interesting experience. We worked alongside Guatemalans, Colombians, and gringos from all over the world. Los Tecnicos is a consortium of a number of groups doing work in different parts of the world, like 4 Walls International out of Tijuana, Mexico, and Long Way Home out of Comalapa, Guatemala, that have come together for their first project in Colombia. All the proceeds from this project in Colombia are going to support the Los Tecnicos Education Center in Guatemala which is focused on environmental stewardship and green vocational training among the local population. The goal of this group is to make affordable housing available for all (these houses apparently cost 1/2 to 1/3 the price of similar homes) as well as creating homes that are off the grid which minimizes their reliance on public utilities and fossil fuels. No electric bill, no sewer bill, no water bill, and also typically include small greenhouses which provide a year round food supplemental supplies. 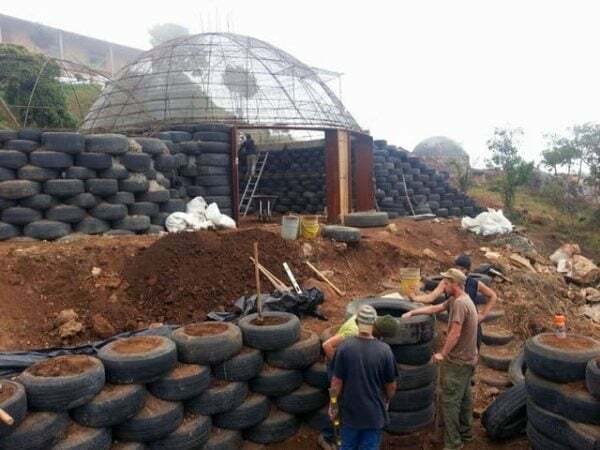 Earthships, as they are known, are able to essentially generate everything you need to survive without having to rely on outside factors. And are especially well-suited to developing countries and remote, rural locations where access to public utilities and infrastructure can be minimal to non-existent. Earthships have been built all over the world from deserts to rugged, mountainous terrain. 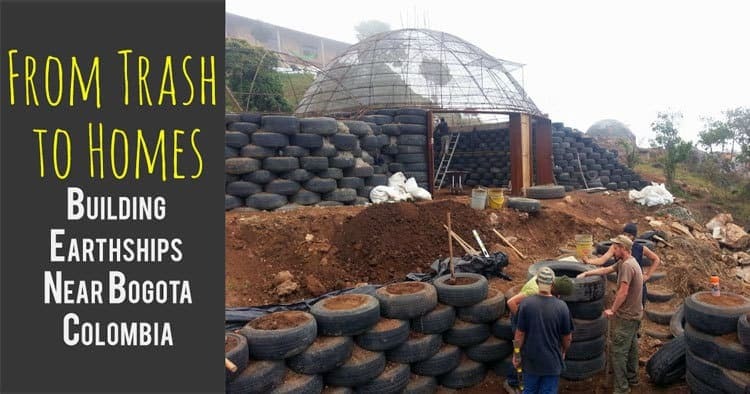 The Earthship idea has its origins in New Mexico in the early ’70s, when Mike Reynolds wanted to create a home that was sustainable, with materials that were available in all parts of the world (ie trash, tires, etc), and would rely on natural energy and free from public utilities. One of the most interesting aspect of utilizing earth-filled tires for walls is the concept of thermal mass, whereby they will soak up heat during the day and then radiate it back out at night–stabilizing temperature fluctuations and regulating the internal climate. And, of course, minimizing or eliminating the need for outside heat sources. If you are curious to learn more about the evolution of the Earthship concept, there is an interesting documentary called Garbage Warrior (which you can watch in its entirety on YouTube here), which follows the story of Mike Reynolds and his work in New Mexico and beyond. All in all it was a great experience that I learned a lot from, even in just one short week. If you have the time and interest, I’d encourage anyone to spend a little time volunteering overseas. This is also not one of those Pay Tons of Money to Work for Free deals either–you just pay to cover your food costs, which was only $70 per week. More than anything though, you get to work alongside some really amazing, passionate people. You’ll work really hard, but you’ll have fun doing it, all while doing good things for others. Please take a second to share this post on Facebook, Pinterest, or Twitter.